Robert Pershing Wadlow. via Wikimedia. However, in that post I didn’t say much about whether giant humans could in fact have existed at one time. The “giant skeletons” article has been viewed tens of thousands of times and has received many comments from people who seem to take it personally that I exposed these photos as faked. Many took it that I was contradicting the Bible account in Genesis, which they believe speaks of a time when giant humans walked the earth. I should point out that very large people have been known even in modern times. The American Robert Pershing Wadlow lived from 1918 to 1940. 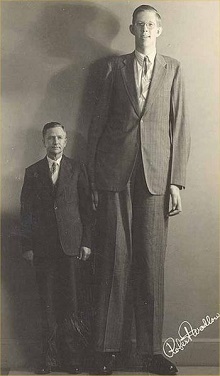 Wadlow reached 8 feet 11.1 inches (2.72 meters) and 492 pounds (223 kg). So it doesn’t seem impossible to suppose that a human could reach a height of 10 feet or so. About giants in the Bible: According to 1 Sam. 17:4, the Philistine giant Goliath was six cubits and a span, about 9 ½ feet tall (2.9 meters). That’s not too much larger than Wadlow. Pre-flood creatures described at Gen. 6:1,2,4 are sometimes called “giants,” but the actual word used there is nefilim, meaning “fellers” in Hebrew, or those who cause others to fall down by striking them. The Bible doesn’t say how big they were. 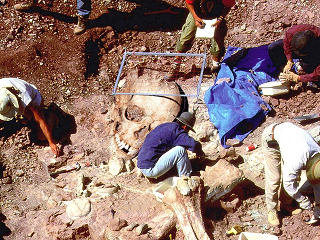 If you look at the first faked photo I show in the “giant skeletons” post, you will see that it shows a skull appearing to be about five feet high (or 60 inches). If you figure that a normal human skull is about seven inches high, the skull in the faked photo would have to represent a human about 50 feet tall. Could a human exist at a height of 40 feet, 50 feet, or more? It’s an interesting question, but it has been explored by competent researchers. Let us take the most obvious of possible cases, and consider a giant man sixty feet high — about the height of Giant Pope and Giant Pagan in the illustrated Pilgrim’s Progress of my childhood. These monsters were not only ten times as high as Christian, but ten times as wide and ten times as thick, so that their total weight was a thousand times his, or about eighty to ninety tons. Unfortunately the cross sections of their bones were only a hundred times those of Christian, so that every square inch of giant bone had to support ten times the weight borne by a square inch of human bone. As the human thigh-bone breaks under about ten times the human weight, Pope and Pagan would have broken their thighs every time they took a step. Movie poster by Reynold Brown via Wikimedia. 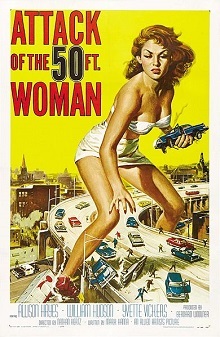 Cecil Adams of The Straight Dope goes into greater detail about the structural problems of being a 50-foot-tall human in his post “Could an attacking 50-foot woman actually exist?” The reference here is to the science fiction movie Attack of the 50 Foot Woman. Adams also explains that a human of that size would run into insurmountable problems with its cardiovascular system, among other difficulties. Given the engineering obstacles around human gigantism, I suggest that we all be satisfied with imagining giants of more modest size. After all, a nine-foot-tall guy would be pretty impressive, no?